The title of this post seems obvious doesn’t it? All vegetables love sunlight – 6 to 8 hours a day is what we all strive for. 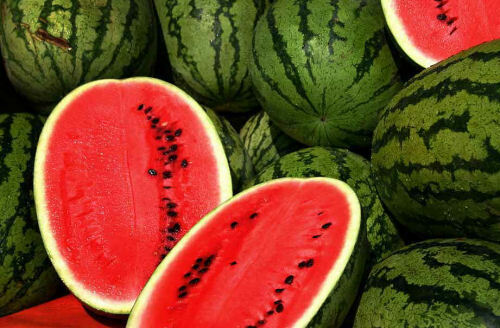 Watermelons love sunlight and will grow best with this much sunlight and more. But looking at my watermelon patch again today has shown me how true the love of sunlight is in a very tangible way. My vegetable garden is on the south side of my house. The watermelon patch is next to a child’s playhouse which shades the patch slightly in the morning. The rest of the day, the vines are in sunlight. The patch gets at least 8 -9 hours of sunlight a day. I was looking at the melons today and marveled at the fact that every single baby watermelon which is finally growing is on the sunniest side of the patch. The whole patch of vines is about 10 feet wide in all directions, but all 6 watermelons are in an area of about 3 square feet in the sunniest part of the patch. I keep looking for hopefuls on the opposite side which also gets the same amount of sunlight. There are vines there that are healthy and lush, but they don’t hold a single hopeful melon. If you don’t know how to tell when a watermelon is ready to pick, check out my post for harvesting watermelons. It gives lots of great tips. This little observation is one of the things I love most about gardening. I have loads of gardening magazines and books that tell me what to do to get the most from my garden, but just watching nature tells me all I need to know, if I just take the time to notice it. In the picture below, all of my melons are on the right side of the patch. The play house is at the top. The right side faces south east. All of the melons are located within 3 feet of the right edge of the vines. 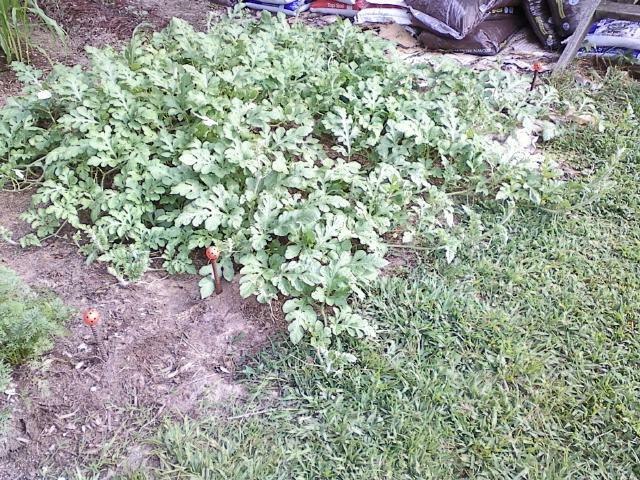 You can read more about my love/hate relationship with this watermelon patch in an article I wrote the other day. What experiences have you had with growing watermelons? Have you managed to grow them in a more shady spot than mine? Please leave your comments below. ← My Mystery Plant – Do you Know what it is?